Eight-year-old Cole Blackaby digs into a piece of chocolate cake like he has never tasted such a treasure. He just met the requirements of at least tasting every food item on his plate to earn the coveted dessert. Cole didn’t know that the cake was partially made with zucchini and the frosting made with chocolate and sweet potatoes. From the look on his face as he devoured every morsel, it didn’t matter. Cole did know something about Square Meals Café, however. “Free food,” he declares when asked his favorite thing about the Farmers’ Market on the Square in Columbia. Cole Blackaby enjoys a piece of chocolate cake that’s part of the Square Meals Café. Zucchini was one ingredient in the cake. Square Meals Café served more than 2,500 meals last year and market coordinators expect to serve more than 3,500 this year. Meals are served every Saturday during the summer and are free to all children and students, through college age. The vision of giving away meals to children came about two years ago when market coordinators noticed two little boys who frequented the market and sampled all the free food vendors made available. They wondered if the boys had food available on other days when the market wasn’t open. “We had this vision and we said, ‘why don’t we do something about this.’ It took us a little while and some experimentation to get it off the ground, but what we wanted to do was give kids a chance to learn to be healthy,” said market coordinator Barbara Armitage. Armitage was the guest speaker at a recent Columbia-Adair County Chamber of Commerce meeting and shared the story of the Farmers’ Market on the Square and the vision behind Square Meals Café. The goal is to serve great food that happens to be healthy to eat, Armitage said. That’s why meals are free to all children, regardless of income. 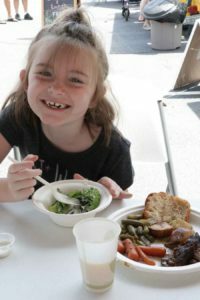 8-year-old Emma Burton enjoys the healthy free meal offered at the Square Meals Café. The market started out working with federal programs but quickly learned they had their own ideas and began asking the local community to help fund the cafe. Now, the program relies completely on local donations. “People say that it’s so nice that we do this for our community. We don’t. We do it with our community,” Armitage said. 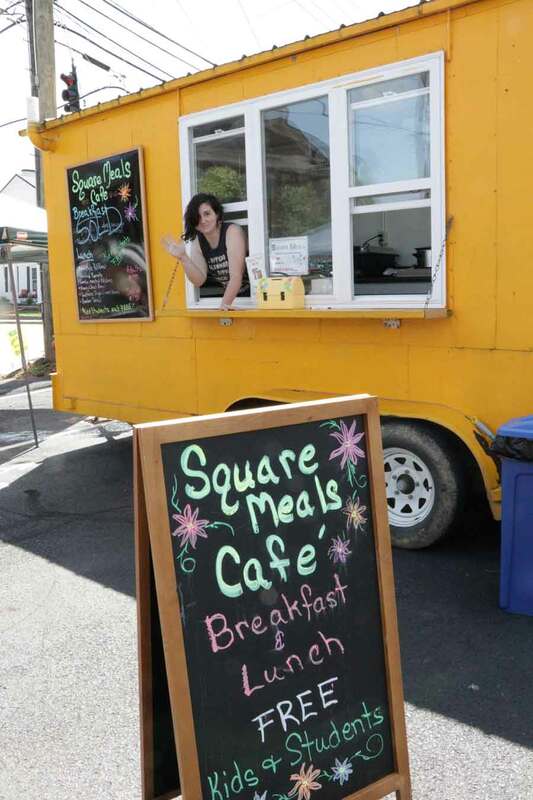 While Square Meals Café is an important part of the Farmers’ Market on the Square, the market in itself is as much an entertainment destination as it is a place to find fresh food. It’s been compared by some to markets in large metropolitan areas because of its variety and atmosphere. Waffle Street, a booth provided by Kellis Booth, sells authentic Leige Belgium Street waffles made from a yeast dough ball with Belgium pearl sugar. 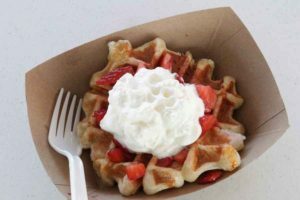 The delectable waffle is a major topic of conversation around Columbia, especially on days like this past Saturday when one person shows up mid-morning and buys their entire inventory. Remaining market goers learn they must wait until next time. Waffle Street, a vendor at the market, sells authentic Leige Belgium Street waffles made from a yeast dough ball with Belgium pearl sugar. They are able to satisfy their taste buds by stepping down a couple of booths, however, and enjoying a ribeye steak sandwich wonderfully prepared by Wayne Armitage. Adults may also eat at the Square Meals Café and are asked for a $5 donation. Columbia resident Tiffany Kessler frequents the market and says she is always amazed at what vendors have to offer. In addition to fresh produce as well as local meats and eggs, there are often local crafts, candles and an array of fun items to purchase. This past Saturday, Kids Nutrition Day promised something free for children at every booth. Youngsters made smoothies, painted pictures of fruit, and took home a plate that displays food portions and proper choices. Those are the things Cole Blakaby’s older sister, Bella, likes best about the market. “We get to do activities,” the 10-year-old said. 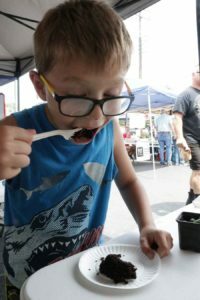 Cole and Bella hope to spend every Saturday morning at the market during the summer with their grandparents, Tim and Lisa Blackaby, who operate Blackaby Hill Farm and sell meat and eggs. During the early marketing season they sell bedding plants then sell fresh produce when it’s ready for market. 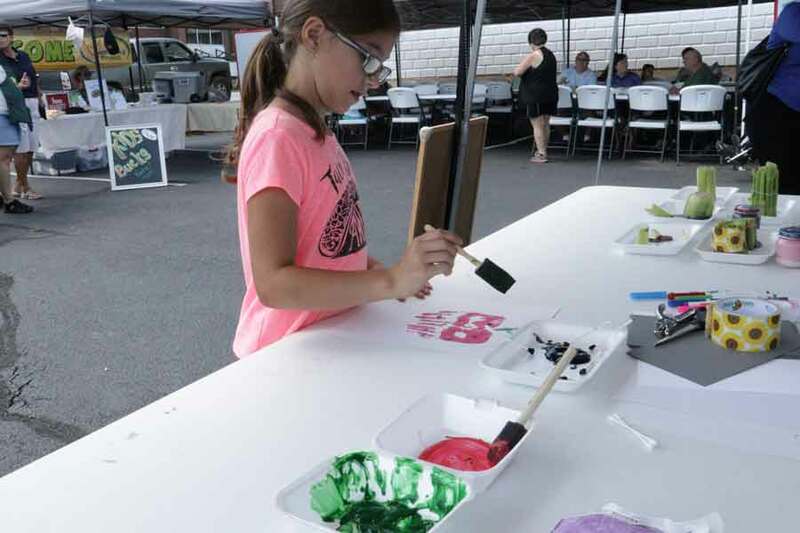 Bella Blackaby creates her own painting during Kids Health day at the farmers’ market. 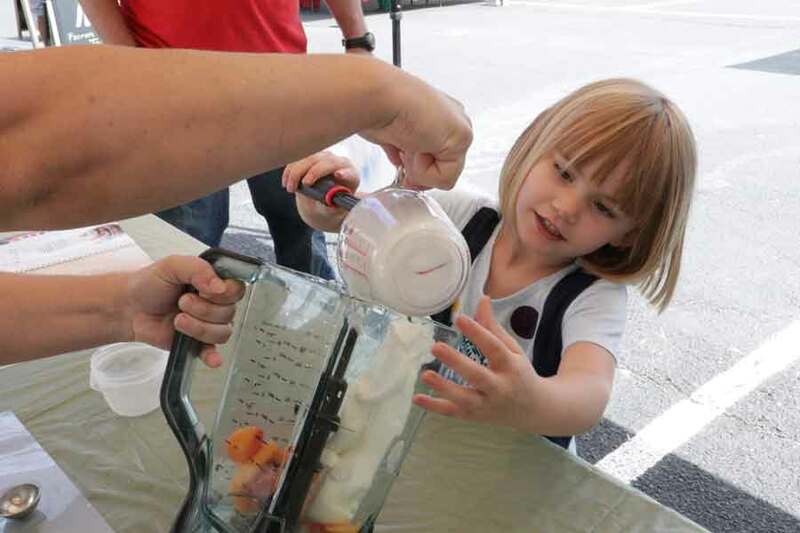 3-year-old Kenzie Humphress makes a fruit smoothie as part of Kids Health Day at the farmers’ market. The market was held on the public square but moved this year just a short distance north on Campbellsville Street to a city parking lot that provides more space and easier access. That space is quickly filling up as vendors are added each week. 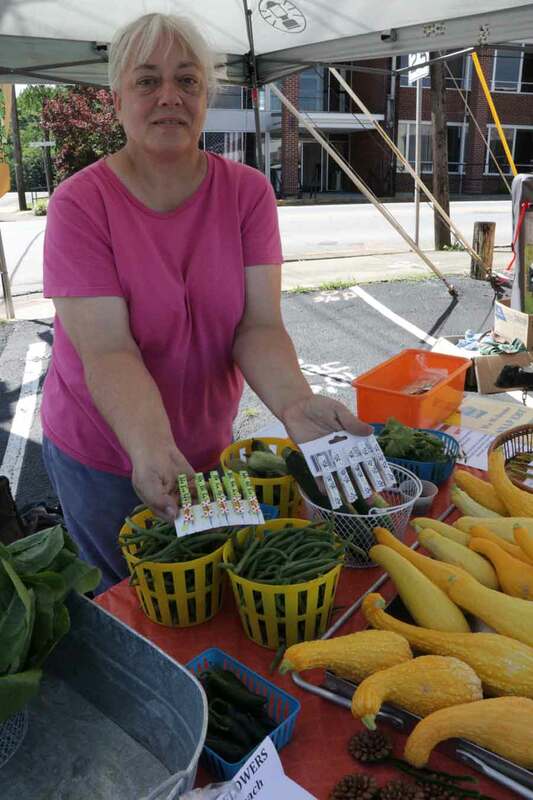 The market is open Saturdays from 8 a.m. until 1 p.m. and Wednesdays from 1 p.m. until 6 p.m. on the corner of Campbellsville and Merchant streets next door to the Judicial Center. Paula Meier, with Sunnie Acres farm, shows off her craft work to turn clothes pins into colorful bag clips. Meier sells craft items as well as fresh goods at the market. Sunnie Acres farm offers an array of products. Volunteer Nat Burton helps prepare meals at the Square Meals Café. 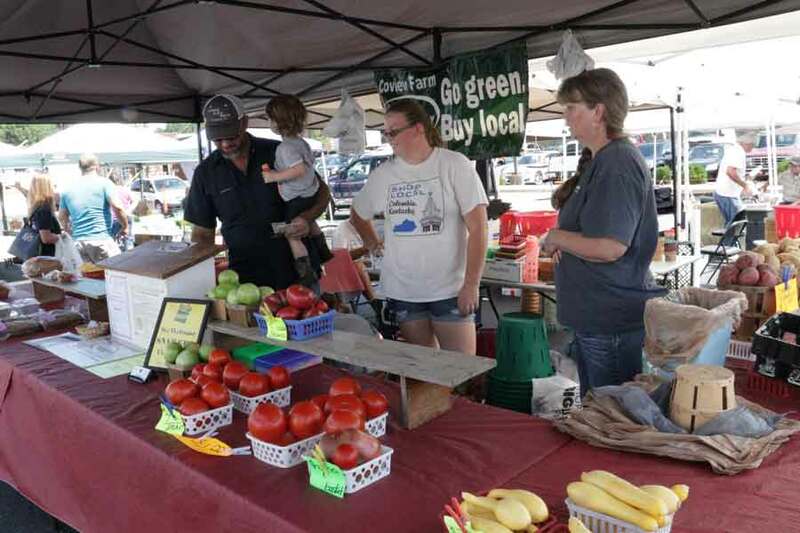 Coview Farm offers an array of fresh produce at the market. 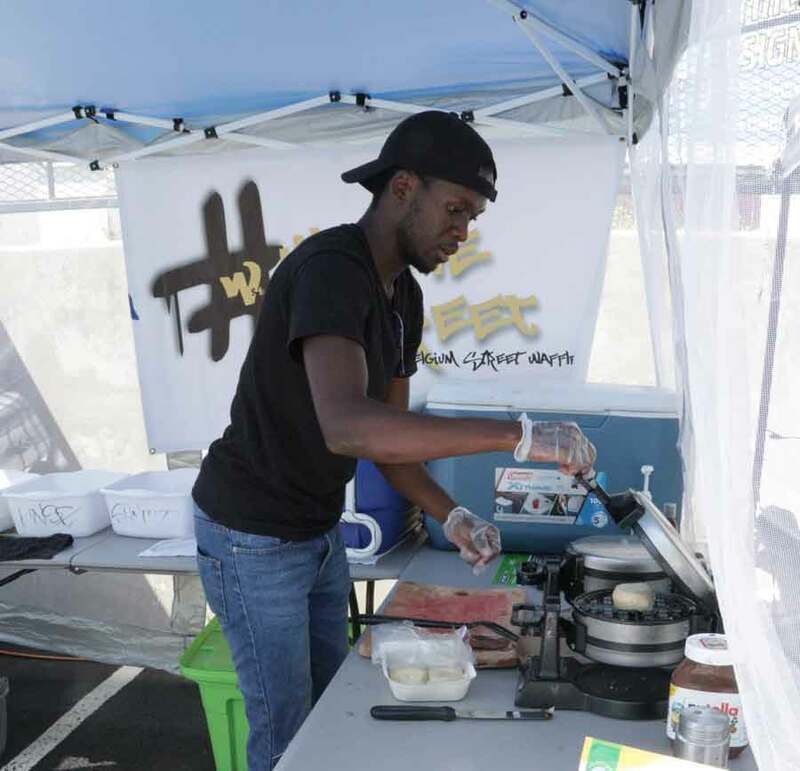 Lindsey Wilson College star athlete Goabaone Mosheleketi made liege Belgium Street waffles at the Farmers’ Market on the Square. Goabaone set a record to win the NAIA national championship in the men’s triple jump during the 2017 NAIA Track and Field national championships.